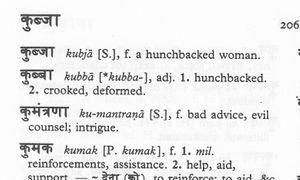 Indian Movies and Unicode -- What? Gupt: The Hidden Truth (1997) (link to wikipedia) was my introduction to Bollywood movies. In 1997 I came across a flyer in a local (Colorado Springs) Indian restaurant announcing a special showing of Gupt in a nearby theater, so I checked it out. It was a Hindi contemporary thriller movie, without sub-titles. And not knowing Hindi, for me it was a chaotic mix of corruption, murders, mobsters, chases, fights and prison breaks, two beautiful lead women competing for the attentions of the hip male lead, some rather un-subtle comic relief - and all randomly interspersed with about half a dozen seemingly unrelated MTV-video-like elaborate and well-done song-and-dance productions with two or more of the leads and beautiful mountain, desert, or lake scenery. My reaction to the movie was "Wow! ", and got me interested in Indian movies generally. A few years later, I finally got the DVD and found out what happened :-). Initially, after seeing Gupt, I rented Indian movies on VHS tapes from an Indian grocery connected to the restaurant mentioned above. The taped movies were typically in Hindi with English subtitles, except also typically the songs were not subtitled - and the songs were often essential to understanding the plot. After a few years, Indian movies on DVD were showing up for rental, and with online movie reviews and mail-order vendors. The DVDs still had the problem (for me) of no English song subtitles, especially for older movies. The script is called Devanagari, and the language is Hindi. Devanagari is used to write Hindi, Marathi, Nepali, and others, and is derived from Sanskrit. The Latin script is the phonetic representation of the Hindi words in Devanagari, and tends to vary a bit depending on who does the representing. 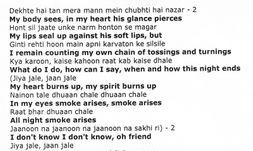 To display or print the Devanagari lyrics from the online sites in the late 1990s or early 2000s, it was generally necessary to download one of several not-quite interchangeable supporting fonts from the lyrics site. In order to help remember how to recognize the sight and sound of Devanagari characters, I wrote a simple VB "Devanagari Flash Cards" program for Windows 98, which displayed a new Devanagari vowel or consonant in with its Latin phonetic representation in a window, controlled by Next/Previous/Random buttons via mouse. the displayed items were obtained by displaying portions of a jpeg "poster" showing all such characters & phonetic representations. During this time the Unicode project was proceeding nicely, organizing character sets of written languages around the world into standardized code blocks of characters with unique code values and combination rules for rendering. I became aware of Unicode as a useful tool with the printing of the 4.0 standard around 2003. Checking into the Unicode Standard site, I found listed a third party application, Babel Map, which looks for Unicode fonts on the installed machine and displays them. Here is a screenshot of BabelMap, a free application available from the author at Babelstone - Definitely recommended. 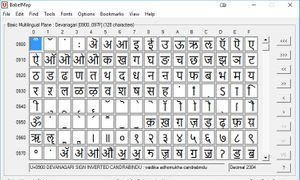 Eventually Microsoft provided a font file "arialuni.ttf" (Arial Unicode MS) with its office products which supported Devanagari, and I rewrote the "Flash Cards" program using the font in several iterations from Windows XP and VB 6 to obtain the current form Devanagari_42 Rev 4 in VB of Visual Studio Express 2015 for Windows 10. These versions all used the text files which I manually prepared once with the initial rewrite to display the basic Devanagari character set, the vowel modifiers for a single consonant, some simple combinations of consecutive consonants with no intervening vowel sound (conjuncts), some common Hindi words in Devanagari, and Indian names (movie stars and Indian office peers). Using the Unicode Standard font descriptions and experimenting with Babel Map (one can display character sequences by clicking on the desired character squares on the application), I found that other "Indic" scripts could be correctly (as far as I can determine) mapped to/from Devanagari since corresponding character positions in the different language blocks all have the same combination rules and sounds. (Most of the other Indic character sets are subsets of the Devanagari set, so not all Devanagari characters will map to a given Indic language set.) So the mapping used is a simple code block offset added or subtracted between corresponding character codes in Devanagari and the set being mapped. The mapped set is displayed in another window of Devanagari_42 when a mapping is selected. Khuda Gawah (1992) takes place in (roughly) 1980's - 90's Afghanistan, where it was partly filmed, and is about an Afghan tribesman who falls in love with a woman in a neighboring tribe, and who must find the killer of the woman's father before she will marry him. The story is interesting, but the music sound quality on the DVD I have is disappointing. The leads are actor Amitabh Bachchan and actress Sridevi, both very well known and still in the business. According to Wikipedia, Amitabh, 75 in 2017, has appeared in over 180 films from 1969 on. I've seen him in many films, but like him best in this role. Sridevi is 20 years younger than Amitabh, but started in movies two years before him and appears in at least as many. I last saw her 2012 comeback movie "English Vinglish" in which she is very good. Devdas (2002) is one of about ten films based on a 1917 Bengali tragic romance novel of the same name. This Hindi version features opulent period sets and costumes, and was likely the most expensive Indian film when it was made. According to the Internet chatter at the time, the film was widely and eagerly anticipated since its two female leads - Madhuri Dixit, with a reputation as one of (if not the) most accomplished dancers in Bollywood cinema from the late 1980's through the 1990's, and Aishwarya Rai, 1994 Miss World and a rapidly rising star as a dancer in the same medium - would appear separately and together in dance sequences in the film, and so: How Would They Compare? By this time, I had seen tape and DVD films of both actresses and was interested, too, but had to wait 6 months past the film release to see it on DVD. This movie has been criticized for rendering the period time and place as more fantasy than historical. But, the story is still good, the opulence is satisfying, and the dancing & songs are very well done. I pretty much ended watching new Indian movies shortly after "English Vinglish" with Sridevi was released in 2012 (it wasn't her fault!). In the intervening 15 years since "Gupt" I've watched a few hundred Indian movies, including about 100 which I purchased for my collection and still watch. The movies have proved to be very interesting and entertaining, and have provided me the opportunity to study a major world language and elegant writing system, along with some fun programming in an unexpected area.